CAFFE is a popular machine learning framework created by the Berkeley Vision and Learning Center. The code base contains more than 55,000 lines of C++, and is optimized for CUDA. The code includes more than 70 CUDA kernels and uses Nvidia’s proprietary CUDNN library. Our goal is to port the code so that it runs on AMD’s Radeon Instinct GPUs, while retaining the ability to still run on CUDA platforms with the original performance. We’ll use the HIP toolset which is designed to convert CUDA code into portable C++ – exactly what we need. HIP provides headers for both Nvidia CUDA and AMD ROCm, a HIP runtime library for ROCm, and set of analysis and porting tools to automate the translation. out[index] = in[index] > 0 ? Figure 1: Hipification of CUDA kernel code into HIP portable C++ code. The red text on the right shows what the tools changed. The hipify tool automatically converts the coordinate indexing (for example “blockIdx.x”) into a format which can be implemented with a macro (“hipBlockIdx_x”). The rest of the kernel is essentially standard C++ with a couple calls into math libraries. HIP provides a compatible library implementation on both ROCm and CUDA compilation paths, so math functions (such as log or exp) are not changed by the hipification process. Figure 2: Hipification of CUDA runtime code into HIP portable C++ code. One again, the red text on the right shows what was changed by the hipify tool. The CUDA runtime APIs (“cudaMalloc”) are transformed into HIP APIs (“hipMalloc”) with similar arguments. Likewise, CUDA datatypes (“cudaStream”) are transformed into HIP data types (“hipStream”). The rest of the host code remains unchanged. Overall the CAFFE port was quite successful – 99.6% of the code was either automatically ported or was automatically converted. A single developer required less than a week to clean up the remaining 200 lines of code to produce a working version on ROCm. Previously we have tried to use OpenCL C-based API to port similar C++ applications. Porting C++ to C is quite a challenging problem, and the OpenCL CAFFE port in fact required tens of thousands of additional lines of code. Much of this code duplicates the CUDA kernels and runtime, and so significantly increases the maintenance cost. In comparison, the HIP port is a small delta from the original code, the conversion is largely automated, and as we will see can replace the CUDA port. The HIP port also includes all the features of the original application, including the multi-GPU, optimized peer-to-peer communication, and CUDNN support. When compiling for CUDA, the code runs through the standard CUDA toolchain (nvcc compiler and library), and developers can utilize the standard CUDA tools (nvprof, CUDA debugger). HIP provides lightweight header files that map the HIP runtime calls back to CUDA, where they use the standard CUDA runtime. HIP also provides lightweight macro expansions for the kernel coordinate functions. CAFFE also utilizes optimized BLAS and RNG libraries. Like the CUDA APIs, the hipify process converts these to use a portable HIP layer. For example, the “cublasSaxpy” library call is transformed into “hipblasSaxpy”. HIP toolkit provides header files that map to cublas on CUDA platform, and to optimized math libraries on ROCm. 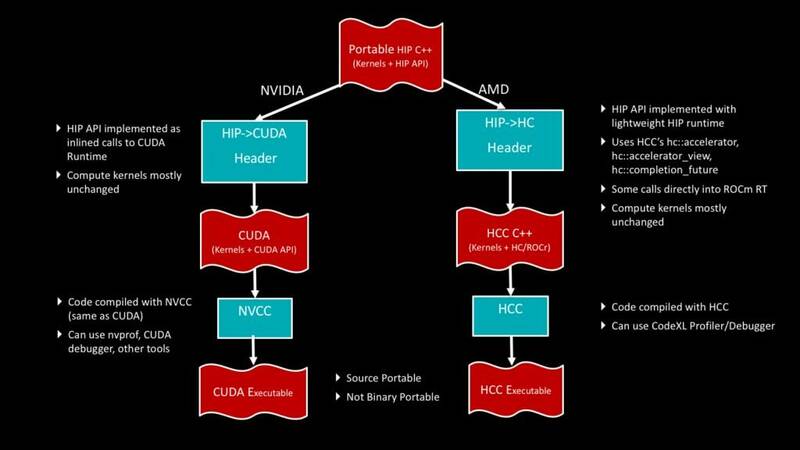 When running on CUDA, the ported HIP application uses a compilation, runtime, and library flow that is very similar to the original CUDA application. Thus, we would expect the HIP/CUDA application to deliver very similar performance as the original CUDA/CUDA app. MIOpen (Machine Intelligence Open) is AMD’s open-source library for accelerating machine intelligence operations such as convolutions, activations, and pooling. MIOpen provides interfaces for HIP and for OpenCL. For example, in the HIP interface, the memory arguments are specified with device pointers, and hipStream_t is used to control where MIOpen executes the requested operations. The library is implemented using a mixture of OpenCL and GCN assembly kernels that are compiled to a standard hsaco code object format. The code object contains the GCN object code and a symbol table. Similar to how Python or C++ applications can call routines written in C or CPU assembly, the code object enables HIP applications to call routines written in OpenCL or GCN assembly. CAFFE is optimized to use the CUDNN library, which provides similar functionality to MIOpen. CUDNN and MIOpen have different APIs, so the conversion is a manual process. Often, we found the same places in the code which called CUDNN would also need to call MIOpen. Our HIP port of CAFFE guards the MIOpen interface code with the “USE_MIOPEN” define, guards the CUDNN interface code with “USE_CUDNN”, and guards the code common to both libraries with “USE_ACCMI”. (“ACCMI” is short for accelerated machine intelligence. These defines allow users to enable or disable the code paths at compile time based on the capabilities of their target platform. On HIP/CUDA, the hip data types (for example hipStream_t, hipEvent_t) are directly mapped to CUDA equivalents (cudaStream_t, cudaEvent_t) and thus the two can be freely interchanged. Thus the HIP/CUDA port also supports the CUDNN optimized code paths, with similar performance to original CUDA code. To enable this path, set USE_CUDNN=1 in the CAFFE Makefile.config and then compile hipcaffe on a CUDA machine. MIOpen provides a significant performance uplift of more than 5X. The HIP port also support multi-GPU scaling and direct peer-to-peer communication. HIP is a powerful tool to port existing CUDA applications, even a large C++ code-base such as CAFFE. As we hoped, the port can run on CUDA architecture with the same performance as the original CUDA application – including using CUDNN. The code can also run ROCm and Radeon Instinct, and is accelerated with MIOpen performance as well. With portability to more hardware and a path to faster performance, maintainers can replace the vendor-specific CUDA with the portable and open-source HIP code. We will be using this to rapidly expand the software libraries and applications which are portable to the Radeon Instinct products – stay tuned! Additionally, this 10-minute video describes the caffe porting experience.